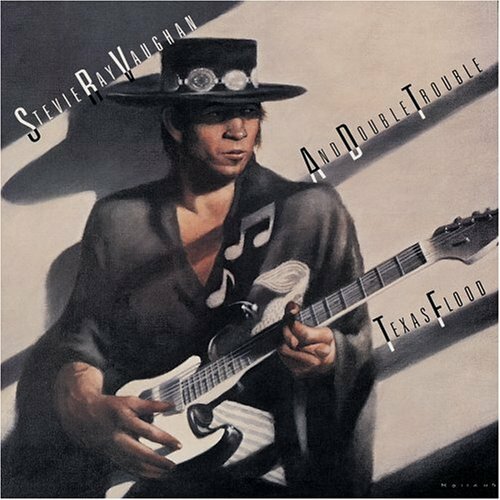 In honor of Stevie Ray Vaughan’s birthday, the 30th anniversary of his debut recording and the release of a new version, Texas Flood (30th Anniversary Collection), I present the following story of the making of Texas Flood. This was written for and originally published in Mojo circa 2001. When Stevie Ray Vaughan and Double Trouble were booked to play the 1982 Montreux Jazz Festival, it seemed that years of gigging and hard work had paid off. At last, the Texans who had spent years touring in a milk truck that leaked oil had gotten their break, becoming the first unsigned act to play the prestigious fest. It was a long way from the small clubs the trio played back home in Austin. Any blues fan today would give their eye’s tooth to witness this show. But the Montreux crowd, not expecting such a blistering assault on their evening and perhaps put off by Vaughan’s unabashed swagger and the simple fact that he was white, was les than enthusiastic. In fact, a good portion of the people present booed while the rest were oddly silent. The show can be seen in its entirety on the two-DVD set, Live At Montreux, 1982 & 1985 (which also includes the band’s triumphant return three years later, as superstars). Watching it now, it is impossible to fathom what the audience was thinking in their tepid-at-best reaction. It is not, however, hard to imagine the crushing disappointment Vaughan must have felt. Photographer Darryl Pitt recalls rushing backstage to console Vaughan, only to find him slumped on a small road case, looking like he had “been hit by a sledgehammer.” The dejection did not last long, however. The band was sitting glumly around its tiny dressing room when a Festival employee stopped by and said that David Bowie was in the house and wanted to meet them all. Vaughan, Layton and Shannon headed for the Musician’s Bar downstairs, where they hung out and chatted with Bowie for hours. 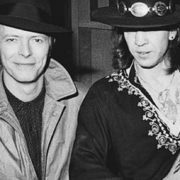 Vaughan was, of course, delighted with the attentions of Bowie, who would soon proclaim the Texan the best urban blues player he’d ever heard and proclaim that no guitar player had juiced him up so much since he saw Jeff Beck in the early 60s at a London club. But Bowie, too, was pleased that the guitar firebrand was paying so much attention to him. On the heels of Low, Heroes and Scary Monsters, Bowie was regarded as a rather fringe artist in America at the time. So it was that when the rock star asked the unknown guitar stud whether he would be interested in doing some recording, the singer was just as pleasantly surprised that the guitarist said yes as the guitarist was that the offer was made. The following night, Vaughan and company were booked to play the same hotel bar. Jackson Browne, who had performed at the Fest earlier that night was doing an interview in his hotel room when several members of his band barged in bubbling with excitement, insisting that whatever Browne was doing, he had to stop it and get down to the bar right now. Following his bandmates downstairs, Browne was similarly awed by what he witnessed and soon climbed on stage. Over the next six months, the meetings with Browne and Bowie would launch the career of Vaughan and Double Trouble and change the course of blues guitar, bu that was far from clear when the band returned to Austin. They were poorer than a church mouse and their immediate prospects didn’t seem any more promising than they had for the past few years. Vaughan decided to take Browne up on his offer. The singer agreed to give the group 72 hours in Down Town over Thanksgiving weekend, 198, and they quickly booked a short tour to help cover their travel expenses. While most of the studio staff wanted nothing to do with helping some raggedy assed unknowns over a long holiday weekend, engineer Greg Ladanyi offered his services. “We went in there, just hoping hoped that maybe we were making a demo that would actually be listened to by a real record company,” says Layton. They were, in fact, recording their debut album, Texas Flood, though the circumstances hewed much more closely to their demo ideas. Returning to the studio newly emboldened, they found that Ladanyi had left. In his place was an assistant, who did not think his job involved more than “pushing the stop and record and buttons.” So Mullen took over, tuned the drums and dialed up the sounds he wanted to hear on Vaughan and Shannon’s amps. He also employed some sound baffles between the players to decrease leakage and allow cleaner tracks of each instrument without forcing the band to physically separate and lose their live vibe. From then on, the band rolled through their repertoire, recording two songs that night and eight the following day. There is some dispute about whether Mullen appeared at the end of the first day or the beginning of the second and whether the whole session lasted two or three days. 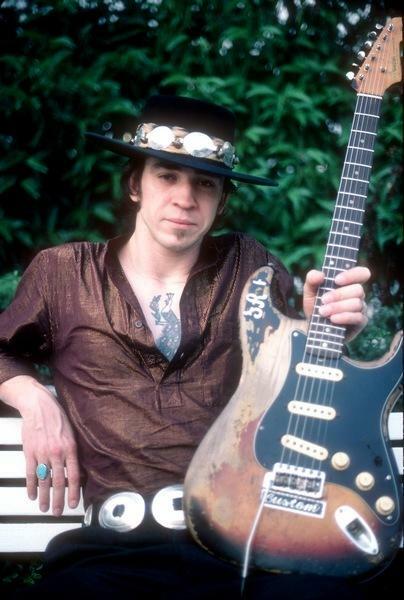 In any case, they definitely did record seven of the album’s eventual 10 tracks on a single day, November 24, 1982, when they also cut “Tin Pan Alley,” a blues classic that was an SRV standard and which appears on Sony’s 1999 remastered version of Texas Flood. Vaughan cut only scratch vocals, adding only these tracks back at Mullen’s Austin studio. 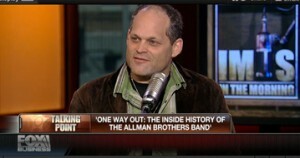 “That whole recording was just so pure; the whole experience couldn’t have been more innocent or naïve,” says Layton. “We were just playing. If we had known what was going to happen with it all, we might have screwed up. But we just went in there and did our live show. The magic was there and it came through on the tape. Vaughan’s hard-edged, vintage sound would soon turn the guitar world’s perception of tone on its head. At the time, rock music seemed eager to leave the past behind. Indeed, many thought guitars passé, with futurists proclaiming that the instrument would be permanently transformed by MIDI applications and replaced as rock’s dominant instrument by the synthesizer. Even many guitar loyalists thought the classic sounds were no longer adequate, transforming their instruments by running them through racks of elaborate, high-tech gear to create heavily processed sounds. Odd-shaped, brightly colored axes were all the rage. 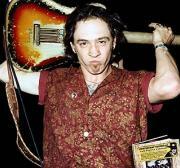 Vaughan’s gear throughout his career was profoundly old school and never more so than on Texas Flood. Eventually, the tones he coaxed from his old but timeless gear would ignite a vintage craze that rages to this day and also launch a new market for small, high-end boutique amplifiers that replicated classic sounds with modern conveniences. Vaughan accepted the offer and flew to New York in the third week of December to join Bowie and producer Nile Rodgers at the Power Studio. Let’s Dance was complete except for lead guitar tracks. Vaughan’s performances, Bowie has said, “ripped up everything everyone thought about dance records.” Vaughan had casually become the linchpin in birthing a sound that Bowie had long heard in his head – a new kind of dance music that combined Euro sensibility with raw American blues power. Blown away, Bowie quickly asked Vaughan to join his touring band and the offer was accepted, though not without some real angst about leaving behind his own group. “Stevie‘s plan was to do it for a year, take the money and pay us to keep the band together,” Shannon says. As rehearsals continued in Dallas, then New York, Bowie and his band grew increasingly excited about the sound they were crafting around Vaughan’s blistering lead work and anticipation rose for bringing this heady brew around the world.. It was not to be, however. What happened next is not entirely clear. Bowie says that as the band was literally loading onto a bus to go to the airport and fly to Europe and commence touring, Vaughan’s manager demanded a much higher salary or else the guitarist would not tour. The offer was promptly rejected, leaving the guitarist and his bags stranded on the sidewalk as the bus pulled away without him. Layton and Shannon have different recollections of the event. They say that Vaughan, already uncomfortable in a sideman’s role and upset that several promises about opening some shows himself were broken, finally snapped when told that he couldn’t mention his own band or music in interviews. Whatever the exact circumstances, Vaughan most definitely did quit Bowie on the eve of a huge world tour to return to Double Trouble and their oil-leaking milk truck. Something was, in fact, already happening. Urged on by Layton and Shannon, who were feeling increasingly desperate that their moment was passing, manager Chesley Millikin had been shopping the 10-song tape made at Browne’s studio and found an admirer in John Hammond. The septuagenarian A&R man, whose discoveries and signings included Billie Holliday, Bob Dylan and Bruce Springsteen, took the tapes to Epic and essentially demanded they sign him. Just like that, and with little other label interest, Vaughan quickly had a deal with Epic Records. “Epic wanted to release our demo right away and we got more attention because people wanted to know who this unknown guy who told David Bowie to take a hike was,” says Layton. Vaughan’s pungent playing on Let’s Dance, redolent of Albert King, garnered attention as well, from fans and fellow musicians alike. With Hammond on board as Executive Producer, Vaughan cut new vocals for “I’m Cryin’” before the album was mixed at New York’s Media Sound and released on June 13, 1983. Texas Flood blew open the locked doors of popular music and proclaimed that blues could be a potent commercial force. The album, combined with the runaway success of Let’s Dance, not only put the unknown Texan on the map but also signaled that uncompromised, from-the-gut guitar music was not dead as a commercial and artistic force. 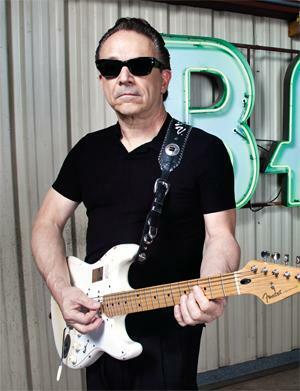 Vaughan’s dramatic arrival not only helped smooth the way for the return of classic blues-oriented rock acts like the Allman Brothers, but it also made the environment more hospitable for his own peers, including The Fabulous Thunderbirds (featuring big brother Jimmie Vaughan), Robert Cray, and Los Lobos, all of whom had hits in the years following Texas Flood. Stevie also shone a bright spotlight back on his original heroes, most of whom had been languishing — overlooked and usually sans record deal. 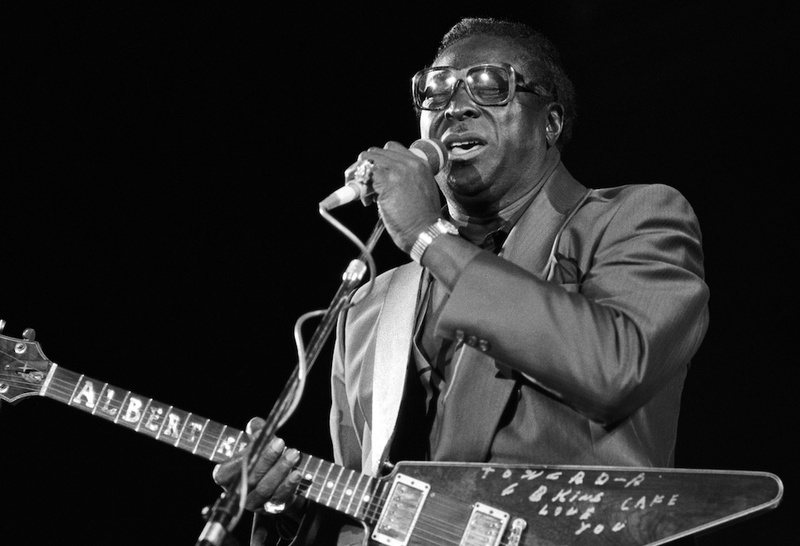 Albert King, Buddy Guy, Lonnie Mack, Hubert Sumlin, Otis Rush and Albert Collins suddenly found themselves once again being hailed as guitar titans, with interest in their music skyrocketing to levels unseen since the white rock audience’s initial discovery of blues in the 1960’s. Certainly, as he himself pointed out, Vaughan owed a huge debt to these originators, but his music was not simply derivative; he hungrily swallowed his influences, fully digested them and crafted a style uniquely his own. In so doing, he succeeded where countless others had failed — reinventing the blues in a manner both visionary and true to the original material. It was a goal shared by every hippie with a Muddy Waters record but accomplished by precious few. The word about Vaughan was out on the blues circuit for years, Raitt adds. Guy, King, Dr. John and others who passed through Austin had long been telling her about this kid who “was just killing it.” With the release of Texas Flood, the rest of the world got hipped as well.